(iii) many of the issues that were highlihted in the bulletin are taken up in the ERI newsletter and /or ERI website which I also edit. Thanks to all those who have provided encouragement in the publication of this bulletin and I hope and pray that we can together continue to work for a more just world. Revelations about the abuse and mistreatment of juvenile offenders in the Northern Territory of Australia have provoked widespread outrage and led to the establishment of a Royal Commission. The revelations also raise wider questions, with some human rights advocates urging a broadening of the scope of the Royal commission to include jurisdictions beyond the Northern Territory, arguing that such abuses are widespread. They also come at a time when a group of doctors are launching a High Court challenge against laws that were passed last year which they say prevent them from speaking out about the conditions they witness in Australian sponsored immigration detention centres. Under the current law anyone disclosing "protected information" gained during their employment or service for the Border Force could face two years imprisonment. Despite this threat, which the doctors believe has deterred other doctors from coming forward, a number of health professionals have gone public about the conditions in the centres. Deeper questions are also raised about the purpose and effectiveness of detention when one considers the different approaches taken in the US and Norway. In Norway the emphasis is on rehabilitation and restorative justice programs rather than punishment, and prisoners are treated with dignity and respect. In the US 76% of prisoners are re-arrested within 5 years of their release. In Norway the figure is 20%. It is also interesting to reflect on the shock and outrage provoked by the Australian Broadcasting Corporation program when concerns about the treatment of juvenile offenders in the Northern Territory have been raised regularly in the print media and when concerns have long been expressed about the soaring incarceration rates in the Territory (one of the highest in the world at 885 per 1000,000 population compared to 716 per 100,000 in the US), the over-representation of indigenous prisoners in prisons. (27% of prison population while only 3% of total population) and the mandatory sentencing laws which result in jail sentences for minor offences and discriminate against people from low socio-economic backgrounds. It also seems significant that after effectively ignoring the situation for so long the government announced a Royal commission within 24 hours of the screening of the program. Perhaps the restrictions on media access to places like Nauru are intended to avert a similar public outrage which might force a change in government policy? This year’s International Day of the World’s Indigenous Peoples on Aug 9th is devoted to the right to education. The right of indigenous peoples to education is also protected by a number of other international human rights instruments, including the Universal Declaration of Human Rights. Goal 4 of the 2030 Agenda for Sustainable Development calls for ensuring equal access to all levels of education and vocational training for the vulnerable, including persons with disabilities, indigenous peoples and children in vulnerable situations. In spite of these instruments, the right to education has not been fully realised for most indigenous peoples, and a critical education gap exists between indigenous peoples and the general population. Where data exist, they show consistent and persistent disparities between the indigenous and the non-indigenous population in terms of educational access, retention and achievement, in all regions of the world. The education sector not only mirrors the historical abuses, discrimination and marginalization suffered by indigenous peoples, but also reflects their continued struggle for equality and respect for their rights as peoples and as individuals. ARE STATES BACKING OFF IMPLEMENTATION OF THE PARIS AGREEMENT? Global temperatures for the first six months of this year shattered yet more records, and mean that 2016 is on track to be the world’s hottest year on record. June 2016 also marked the 14th consecutive month of record heat for land and oceans. It marked the 378th consecutive month with temperatures above the 20th century average. All of which underlines the importance of Sep 21st meeting where world leaders are asked to to deposit their instruments of ratification, acceptance, approval or accession to the Paris Agreement on climate change. Out of 178 countries which signed the Paris Agreement in April this year, only 19 have ratified it so far, together accounting for less than 1 percent of greenhouse gas emissions. Concerns have also arisen that some countries are already backtracking on the commitments made in Paris with newly elected Philippines president Duterte announcing that he “will not honor” the proposed restrictions on emissions. Concerns have also been expressed about Germany and the UK recently announcing new measures to support the fossil fuel industry and US presidential candidate Donald Trump stating he would cancel the agreement if elected in November. For suggestions for actions you can take on this issue visit the Australian Religious Response to Climate Change website. 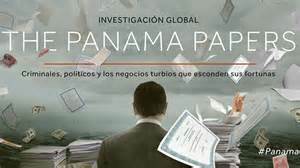 It is now almost four months since the revelations of the ‘Panama Papers’ – a massive leak of more than 11.5 million financial and legal records from the law firm Mossack Fonseca – exposed an elaborate system of fraudulent shell companies with concealed ownership that allow the wealthy to hide money owed to the public. Although laws have also been enacted in a number of countries to ensure greater transparency and accountability including the United States , New Zealand and a number of African countries, the focus of media and public attention has been on rich and famous individuals, world leaders, high profile sportsmen and wealthy business leaders. Concern is growing that an opportunity to address the far more serious problem of widespread, routine corrupt business practice is being missed. Global Finacial Integrity estimates that opacity in the global financial system, thanks to tax haven secrecy, anonymous companies, trade-based money laundering, and lax financial crime enforcement, drains at least US$1.1 trillion per year out of developing and emerging economies—more than these countries receive in foreign direct investment or foreign aid combined. This global shadow financial system bleeds the world’s poorest economies and propels crime, corruption, and tax evasion. Visit the JustAct website to sign a petition urging the Australian government to take action to address this issue. Over the last 25 years, Australia has achieved some significant milestones in its journey of reconciliation with its indigenous peoples. These include the establishment of native title, the Apology, the Closing the Gap framework and progress on constitutional recognition of First Australians. While much goodwill and support for reconciliation is growing across the Australian community, racism, denial of rights, and a lack of willingness to come to terms with its history continue to overshadow the nation’s progress towards reconciliation. The campaign to RECOGNISE Aboriginal and Torres Strait Islander peoples in Australia’s Constitution and ensure there's no place for racial discrimination in it. The Close the Gap campaign which has the goal is to close the health and life expectancy gap between Aboriginal and Torres Strait Islander peoples and non-Indigenous Australians within a generation. National Sorry Day an annual day of atonement for the perhaps well-intentioned but misguided policy that forcibly removed an estimated 50,000 children from their Aboriginal families between 1910 and the 1970s. Edmund Rice International is an ECOSOC accredited NGO working within the UN. This means that it can be active within the UN in a variety of ways. From its very inception, NGOs have been recognised as having a major role to play within the UN, particularly with regards to human rights. Increasing restrictions on the work of NGOs and harassment of human rights defenders by States are particularly concerning. Of particular concern is the restriction of civil society at the UN through an increasingly politicised and non-transparent accreditation process for NGOs. The accrediting committee is currently made up of 19 countries, several of whom, Russia, China and Cuba for example, often act to suppress the voice of civil society. The system works in such a way that any committee member can defer the decision of accreditation until the next session by a single question. Members will also make deals to ask questions on each other’s behalf to further hinder the process, or will work together to push a vote of rejection or “non-action” to prevent the accreditation of an NGO. One example of this is the Iran Human Rights Documentation Center who have been deferred on eight separate occasions through 38 questions put forward on behalf of Iran. There are civil-society allies on the committee such as the US, however they can only do so much and only have so much political capital to expend on this issue. The above example is symptomatic of a wider problem. Civil society around the world is increasingly being silenced through violence and suppression of rights. For example in Russia, Egypt and India, NGOs are required to register which gives the authorities the power to block overseas funding, freeze assets and even shut down organisations who do not register. In Sudan, police forces use sexual violence to silence female human rights defenders. In the past three years over 50 countries have introduced or enacted measures to restrict civil society. According to the World Press Freedom Index only one third of the world’s countries have a fully free press. In his most recent report the UN Special Rapporteur on the Situation of Human Rights Defenders drew attention to reports of reprisals against those who have spoken to the United Nations, made statements, sent documents or messages, or cooperated with it. He noted that reprisals or the threat of reprisals can take very sophisticated forms and States themselves have become aware of the power of reprisals to muzzle human rights defenders or prevent them from speaking out. Such attacks may take a variety of forms: personal threats or threats against members of defenders’ families, smear campaigns, death threats, physical attacks, kidnapping, judicial harassment, murder and other forms of police harassment or intimidation. Climate change is fast becoming one of the most significant risks for World Heritage sites across the globe. Designated for their global significance and universal value to humankind, many World Heritage sites are major tourist destinations. Some are among the most iconic places on Earth. Now rising seas, higher temperatures, intensifying weather events, and other climate impacts threaten many of these locations and the local economies that depend on them. This new report lists 31 natural and cultural World Heritage sites in 29 countries that are already being impacted by climate change and are vulnerable to increasing temperatures, melting glaciers, rising seas, intensifying weather events, worsening droughts, and longer wildfire seasons. 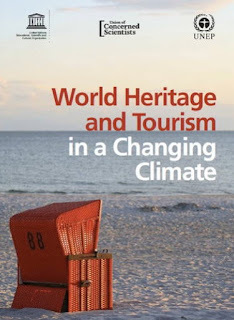 - Identify the World Heritage sites that are most vulnerable to climate change and implement policies and provide resources to increase resilience at those sites. - Ensure that the threat of climate impacts is taken into account in the nomination and listing process for new World Heritage sites. - Engage the tourism sector in efforts to manage and protect vulnerable sites in the face of climate change and educate visitors about climate threats. At the request of the Government of Australia, references to Australian sites were removed from the Report (however recent information about the state of conservation of the Great Barrier Reef is available on UNESCO’s website. 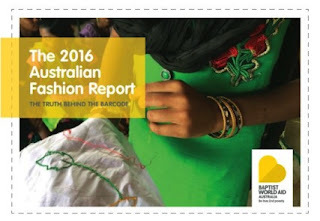 The 2016 Australian Fashion Report has recently been published which rates 87 different clothing companies based on policies, knowledge of and relationships with suppliers and respect for worker’s rights. The report suggests that while some progress is being made, much remains to be done to address the working rights of those who make our clothes. As a result workers are left vulnerable to forced labour and exploitation and also means that companies can be unwittingly paying for child labour (there are today 168 million child labourers and 14.2 million people in forced labour). It also means that tragedies like the Rana Plaza factory collapse when 1,136 workers were killed in Bangladesh are allowed to happen. The report also includes several case studies, which demonstrate how little it would take to improve the conditions of garment workers with a very small increase in retail price. In every section there are examples of good practice and inventive ways to improve conditions. These include Boden who gave their workers the opportunity to submit suggestions anonymously using mobile phones and the Cotton On Group which is acting to produce ethical cotton in Kenya. In many cases the fashion industry has the potential to make a real contribution to helping local communities develop. There are several positive business practices described in the report, for example Pacific Brands in one year achieved a 7% decrease in working hours with a 20% increase in monthly income followed in the next year by a further 15% reduction and a 15% increase in wage levels. However many companies could do more. Two thirds of the companies studied have taken no action on paying a living wage. Failure to implement changes leads to excessive overtime, a cycle of poverty and ultimately a suppression of human rights. This blogsite had its origin as a means of linking students from Christian Brothers Schools in Victoria, Australia who attended the Social Justice days I organised or who participated in school retreats I helped facilitate. It arose from a belief that as well as charity, advocacy for human rights can also be a compassionate response for those who experience injustice and deprivation. In other words we can address root causes rather than just symptoms.